Dexter Daily: Q&A With Michael C. Hall and Kevin Dutton About "The Wisdom of Psychopaths"
Q&A With Michael C. Hall and Kevin Dutton About "The Wisdom of Psychopaths"
What makes a psychopath happy? Michael C. Hall, who embodies one of the most attractive psychopaths on television, Dexter, explores his characterization with renowned British psychologist Kevin Dutton, author of The Wisdom of Psychopaths. 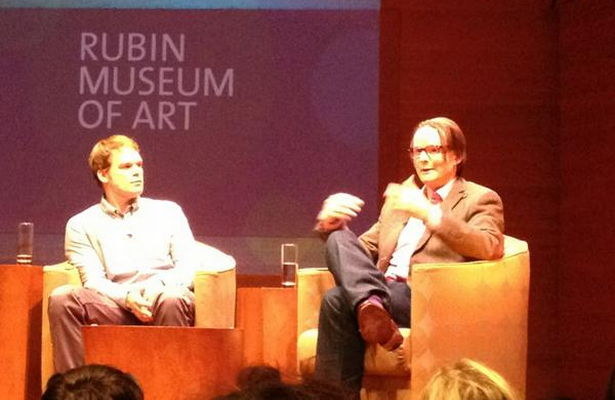 Read below the Q&A from the Rubin Museum of Art, which took place yesterday (October 24). What quality of Dexter would you want for your own? His capacity for stress management. Do you ever have to let Dexter wear off? Depends on what I’m playing that day. The idea that Dexter is performing a service for society is an interesting twist… He’s the cuddliest serial killer. What separates humans from animals is our biggest fear, death. that fear explains our fascination with serial killers. Dexter justifies his freedom by being a guardian demon rather than a guardian angel. Do you prepare yourself to play Dexter? When I put on that kill suit, that does the job. Two things make psychopaths happy, instant gratification and control. Dexter covers room with plastic to control chaos from kill. Whenever Dexter can’t release his controlled urges he risks losing control. How did you research Dexter? Read books, watched movies, didn’t talk to any psychopaths because I thought it would effect role. Psychopaths are very positive people because they don’t care about the negative side effects of their actions. Ask yourself what would I do if I didn’t care. Been wondering what I’m going to do when show is over, I’m thinking self help. You could argue that Dexter is the way he is not because of his trauma with his mother, but because of the abuse of his father. It’s not really about his father any more, it’s him. He’s having a conversation with himself. It is rare to meet a psychopath who doesn’t want to be one, usually they’re quite happy with their lives. Is Dexter happy? Dexter has moments of happiness, or at least contentment, specifically after a kill.